Leukemia is known as a cancer of a person's blood or bone marrow (Leukemia Research Foundation 1). The Leukemia Research Foundations states, "It is characterized by the widespread uncontrolled proliferation of large numbers of abnormal blood cells, usually white blood cells, which take over the bone marrow and quickly spread to the blood stream" (Leukemia Research Foundation 1). In other words, your blood cells are produced abnormally and destroy the bone marrow . Today, 129 Americans will be diagnosed with leukemia and 60 of them will not survive (Leukemia Research Foundation 1). Leukemia is found to be 10 times more common in adults than it is in children (Leukemia Research Foundation 1). In 2012, there are expected to be about 47,150 new cases of Leukemia and about 23,540 deaths (Leukemia Research Foundation 1). 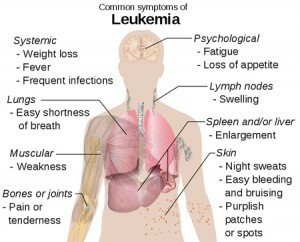 This picture shows symptoms of leukemia and where it occurs. The awareness ribbon for leukemia is orange in color. This picture depicts the difference of blood cells in leukemia from normal cells. The first recognition of leukemia was in 4th or 5th century B.C.E by the ancient Greeks (Shannon McGlauflin, Jolene Munger, and Rebecca Nelson 1). It was otherwise discovered in 1845 by John Hughes Benet (Shannon McGlauflin, Jolene Munger, and Rebecca Nelson 1). The four main types of leukemia were determined in 1913 (Shannon McGlauflin, Jolene Munger, and Rebecca Nelson 1). It was affirmed that there was a possible antidote for leukemia in 1970 (Shannon McGlauflin, Jolene Munger, and Rebecca Nelson 1). Leukemia has been in existence for a very long time. A common side effect of leukemia is hair loss, as seen in this young boy. 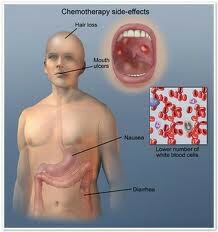 Chemotherapy, a treatment for leukemia, often causes hair loss, mouth ulcers, nausea, and diarrhea. 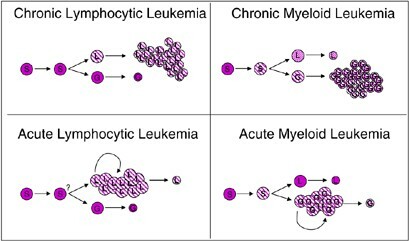 Shown here is the composure of stem cells in the leading four types of leukemia. According to Medical News Today, leukemia has a large variety of possible causes (Nordqvist 1). Some of the causes include exposure to radiation, working with specific chemicals, chemotherapy, down syndrome, hair dyes, electromagnetic energy, and genetic predisposition (Nordqvist 1). Genetic predisposition studies the families of the person as well as studying twins (Nordqvist 1). All of these will affect people in different ways and may or may not cause cancer. Though many of these are not proven, they are high suspected of being a main cause. The main symptoms of leukemia are often comparable to that of the flu. This includes weakness, fatigue, headaches, fever, chills, and nausea (Nordqvist 1). Weight loss may be possible if the spleen has been enlarged (Nordqvist 1). Poor blood clotting is another symptom of leukemia (WebMd 1). This will cause the person to bleed and bruise easily. Leukemia often causes a weakened immune system (Nordqvist 1). Anemia, the loss of red blood cells, is a known symptom for leukemia as well (Nordqvist 1). There are four common types of leukemia. They are Acute Lymphocytic Leukemia (ALL), Chronic Lymphocytic Leukemia (CLL), Acute Myelogenous Leukemia (AML), and Chronic Myelogenous Leukemia (CML) (Nordqvist 1). Acute leukemia is faster working and more severe, while Chronic leukemia processes slowly (WebMd 1). 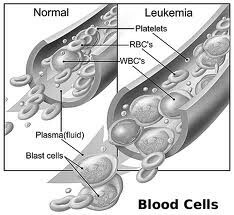 Lymphocytic leukemia alters the while blood cells known as lymphocytes, while Myelogenous leukemia affects the white blood cells named myelocytes (WebMd 1). Acute Lymphocytic Leukemia mainly affects children, but the other three types generally affect adults, although it is possible to go either way (Nordqvist 1). There are four main type of treatments for leukemia (Cancer Treatment Center of America 1). They are chemotherapy, radiation therapy, immunotherapy, and stem cell and bone marrow transplants (American Society of Hematology 1). Chemotherapy is a treatment to help destroy cancerous cells and tumors by using drugs (Cancer Treatment Center of America 1). Chemotherapy is the most well-known treatment for cancer. Radiation therapy destroys cancerous cells by using energy (Cancer Treatment Center of America 1). Immunotherapy uses your immune system to beat off the cancer (Cancer Treatment of America 1). Mayo Clinic Staff states "A stem cell (blood or marrow) transplant is the infusion, or injection, of healthy stem cells into your body to replace damaged or diseased stem cells" (Mayo Clinic Staff 1). The side effects for leukemia is caused by chemo and radiation therapy (Leukemia BMT Program 1). They include bad bladder, bleeding and transfusion, cardiac effects, sexuality, diarrhea, and fatigue (Leukemia BMT Program 1). Hair loss, the liver, the lungs, nausea, vomiting, relapse, rashes, sore throat, and an effect on your taste buds are other common side effects (Leukemia BMT Program 1). A patient may bruise much easier and lose their energy (Cancer Compass 1). The most visual side effect in a patient is the crucial hair loss. Nordqvist, Christian. "What Is Leukemia? What Causes Leukemia?" Medical News Today. MediLexicon International, 17 Mar. 2009. Web. 16 Oct. 2012. McGlauflin, Shannon, Jolene Munger, and Rebecca Nelson. "History of Leukemia." History of Leukemia. N.p., n.d. Web. 16 Oct. 2012. "Leukemia Research Foundation." Leukemia Research Foundation. N.p., n.d. Web. 16 Oct. 2012. <http://www.leukemia-research.org/page.aspx?pid=214>. "Leukemia Symptoms - Symptoms of Leukemia." WebMD. WebMD, 03 Jan. 0000. Web. 16 Oct. 2012. <http://www.webmd.com/cancer/tc/leukemia-symptoms>. "For Patients & FamiliesComplications & Side Effects." Complications & Side Effects: The Leukemia/Bone Marrow Transplant Program of BC. N.p., n.d. Web. 16 Oct. 2012. "Causes of Leukemia." Causes of Leukemia. N.p., n.d. Web. 16 Oct. 2012. <http://leukemia.emedtv.com/leukemia/causes-of-leukemia.html>. "Cancer Treatment Centers of America: Leukemia Treatment." Cancer Treatment Centers of America: Leukemia Treatment. N.p., n.d. Web. 16 Oct. 2012. "American Society of Hematology." Leukemia. N.p., n.d. Web. 16 Oct. 2012. <http://www.hematology.org/Patients/Blood-Disorders/Blood-Cancers/5230.aspx>. "Leukemia." Side Effects Ã¢ÂÂ Treatment Information. N.p., n.d. Web. 16 Oct. 2012. <http://www.cancercompass.com/leukemia-information/side-effects.htm>. "Leukemia Cure, Causes, Diagnosis, Symptoms, Types and Treatment on MedicineNet.com."MedicineNet. N.p., n.d. Web. 16 Oct. 2012. Staff, Mayo Clinic. "Definition." Mayo Clinic. Mayo Foundation for Medical Education and Research, 22 Aug. 2012. Web. 17 Oct. 2012. "Google Images." Google Images. N.p., n.d. Web. 16 Oct. 2012.